Apart from Bayesian Algorithm Spam Reader uses custom dictionaries for filtering. These dictionaries are initially empty and can be created and edited by the user. 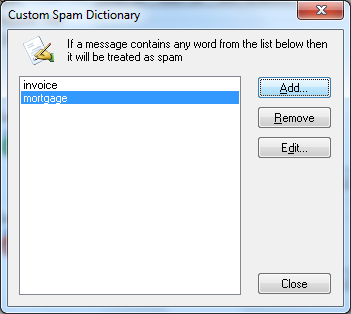 Custom Spam Dictionary is a list of words and phrases that the user considers inappropriate in e-mail messages. So, if a message contains any word/phrase from Custom Spam Dictionary Spam Reader will consider this message as spam. Custom Non-Spam Dictionary is a list of words and phrases that are typical for the subjects important for the user. If a message contains a word/phrase from Custom Non-Spam Dictionary Spam Reader will consider this message as legitimate. If you want to edit the Custom Dictionaries click on the corresponding "Edit" button on the Bayesian Filter tab of the program options. You will see the window where you can add/remove or edit dictionaries items.